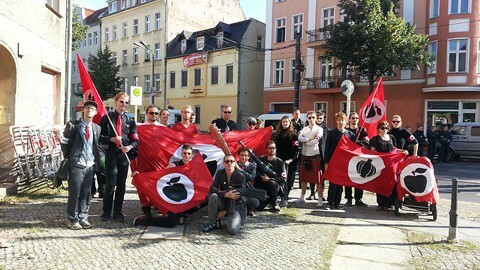 The German Apple Front, founded in the city of Leipzig in 2004 by Alf Thum, has since fostered a similar satirical political group in Hungary known as the "Hungarian Garlic Front" (Magyar fokhagymafront - MFF). This unusual political group attempts to fight far-right politics in Hungary by ridiculing the far-right political culture. They attempt to show how senseless and absurd extreme-nationalism is by mimicking and making fun of the extremist activities. Their German counterparts even dress up in uniforms resembling the black NSDAP Schutzstaffel, ranting and raving in their performances like the National Socialist demigods of old. 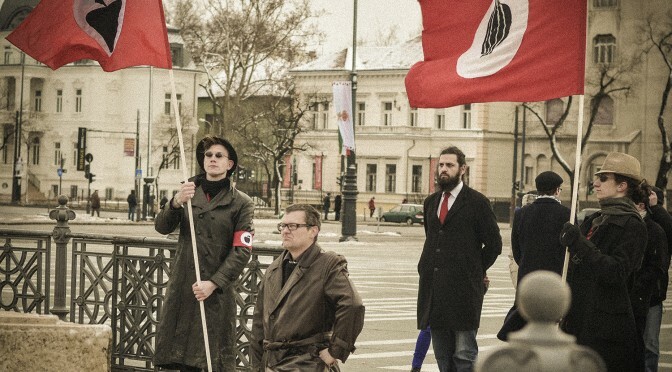 The Hungarian group appear to be a bit more subdued by only wearing red armbands similar to German one but replacing the apple in the white circle with a garlic poking fun at neo-Nazis by manipulating their symbols and slogans. Flags displayed by the Hungarian Garlic Front don't appear to have any standard design. Although its hard to see in the attached pictures, the garlic element the first variant MFF flag has light detail stitching on the black silhouette. Hopefully more talanted illustrators can make better drawings of this flag. Also if you look closely at the second flag in from the right in Photo #1, it does not appear to either be an apple or garlic. Then looking closely at the right hand flag on the Photo #2 it almost appears to be a watermelon - certainly, at the very least, it is a variant of the flag normally displayed by the Garlic Front. All the other flags appear to be those of the German Apple Front. It seems there are variant depictions of garlic - see this youTube video and this FaceBook page. Clearly, the garlic is depicted in more than one way. I believe both of these photos are the same variant. Because these flags appear hand-made they all seem to be simply different interpretations of the Hungarian Garlic. I've since found a several more of these variants to add to the collection from their FaceBook page.